English football is in a state of crisis. It has been almost 50 years since England made the final of a major championship and the national sides, at all levels, continue to disappoint and underperform. Yet no-one appears to know how to improve the situation. 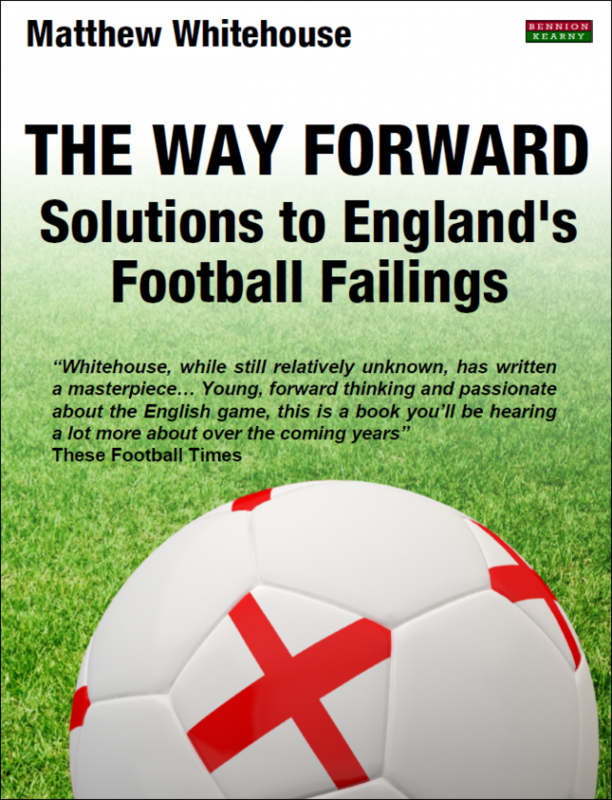 In The Way Forward, football coach Matthew Whitehouse examines the causes of English football’s decline and offers a number of areas where change and improvement need to be implemented immediately. With a keen focus and passion for youth development and improved coaching he explains that no single fix can overcome current difficulties and that a multi-pronged strategy is needed. If we wish to improve the standards of players in England then we must address the issues in schools, the grassroots, and academies, as well as looking at the constraints of the Premier League and English FA. Unafraid to speak his mind, Matthew Whitehouse makes a well researched and compelling case for all footballing parties to work together to improve standards and modernise their approach. Improvements need to come from the FA and their work with grassroots football to increase the quality of coaching, as well as from the academies who need to do more in terms of the environments they create for producing elite players. An improvement in scouting, talent identification, sport science, and attitudes is also long overdue. Unless change is implemented soon, England will continue to exist in the backwaters of international football – enviously watching the likes of Spain, Germany, Holland and others, as they deliver high quality teams that are able to win tournaments. 1. Better Talent Identification is needed – incorporating a more contemporary and forward looking view of what is required in the modern player. 2. Coaching standards at the grassroots level needs to be significantly improved to develop players with better technical and tactical ability and game understanding. At the academy level, mediocrity should not be accepted; at this level coaching needs to become more elitist. 3. Sports Science in academies needs to be ramped up in order to develop better athletes who are fast, agile, and explosive. Sport psychologists need to be part of every academy set-up as well as part of FA youth module courses. They need to help develop players and coaches to understand and utilise the winning disposition of growth mindsets. 4. Make sure that English players actually play top level football. This means youngsters signing for clubs where they can actually make the first team (rather than bench warming, or forever going on loan, for mega clubs), and playing for Team England right through the age groups. No fast tracking of players into the senior squad, or arrogant players excusing themselves from Under-21 tournaments – they need game time! 5. Regional talent centres. The FA needs to develop regional development centres for each county in which fulltime A licence coaches work with gifted and talented 11-15 year olds. Talent centres will bridge the gap between the grassroots and academy football which, at this stage, is too large for many players. A UEFA ‘A’ licenced coach with a Masters degree in Sports Coaching he has extensive experience both academically and practically on coaching and youth development. Matthew is also a prominent and influential writer and is the editor of the award winning The Whitehouse Address blog.